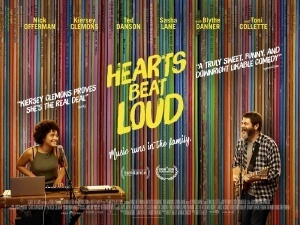 This was a film I desperately needed to watch, especially after sitting through an incredibly bleak and dour movie like The Escape; Hearts Beat Loud is a very different kind of escape, only this one is far lighter in tone, is a hell of a lot sweeter, and makes you feel so much happier about life and people in general. The movie, directed and co-written by Brett Haley, is about Frank Fisher (Nick Offerman), a former musician who now runs a record shop in Red Hook, New York, and is preparing to send off his teenage daughter Sam (Kiersey Clemons) to UCLA for a medical degree. During one of his and Sam’s jam sessions together, they create a song called “Hearts Beat Loud” which Frank is so impressed by that he uploads the song to Spotify without his daughter’s consent. He later becomes inspired when he hears the song play in a local café, and attempts to convince Sam to continue writing and creating music with him – Sam, however, would much rather focus on her studies, and spending time with her new artist girlfriend Rose (Sasha Lane), while Frank has bigger fish to fry such as the impending closure of his record shop, a budding romance with his landlady Leslie (Toni Collette), and dealing with his elderly mother (Blythe Danner) who is continuously getting into problems with the law. Nonetheless, he becomes determined to make music and spend more time with his daughter, who hasn’t yet left the neighbourhood but might as well have already. This is a film that is so upbeat and really puts you in such a good mood that it becomes irresistible, though unlike another recent crowd-pleaser, Mamma Mia! Here We Go Again, this movie has its foot much deeper in the real world and incorporates some harsh truths which wouldn’t usually find their way into a movie designed to make the audience feel good about life. This is a story where financial woes and changing times do cause stores such as Frank’s to go out of business, and there is no third-act arc to try and save it from closure, either; Frank straight up admits, despite Leslie’s ideas to fix it up and maybe even add a little coffee stall, that he wants to close it down because he doesn’t want to be doing it anymore, and the inevitable climactic live musical show isn’t done to save it from fading into obscurity but rather to send it off into history with good vibes and positive attitudes. The movie does well in avoiding most of these clichés that in lesser versions of this script would be both present and correct, but co-writers Haley and Marc Basch find a way to incorporate real-life decisions with a feel-good attitude that puts everything in a much more positive light, and it’s executed in a manner that really makes you feel as warm as the key father-daughter relationship is. Offerman and Clemons have a fun on-screen banter with each other, one that only fathers and their offspring tend to have with each other (having lived with my own father for most of my life, I totally get where this movie is coming from) which never feels forced or unnatural from either party; but musically, they both shine in ways neither actor has managed to do before. The original songs created specifically for this film are wonderful and upbeat, and makes you wonder if they have the kind of lasting power that gets them noticed for Original Song categories this coming awards season (though if Sing Street couldn’t get a single one of its songs nominated for an Oscar, then don’t count on the Academy locking this one in for a nod; although they did award it to Hustle & Flow’s “It’s Hard Out Here For A Pimp” that one year, so anything’s possible in this category), and both of them have nice singing voices and strong musical abilities with the guitar and other instruments, which contribute to the smooth and fun soundtrack. The songs and musical cues help elevate the film’s already present likeability, and are well-placed throughout to give your ears just as good a time as your eyes. It’s an incredibly sweet film that has a lot of heart and charm to it, and presents progressive scenarios that are duly and refreshingly accepted by all the characters and never used as a put-down at all; nothing is ever made of the fact that Sam is mixed-race following Frank’s marriage with his black wife who has since passed in a cycling accident, nor that she is in a relationship with another girl (Clemons and Sasha Lane have a really lovely chemistry together, and on a side note it’s good to see Lane’s career keep on going strong following her stunning debut in American Honey; also look out for her in the upcoming The Miseducation of Cameron Post), and those are facts that would be brought up by people insecure about their feelings towards interracial and homosexual relationships but here are accepted and embraced with open bear arms. This is the kind of movie that really makes you feel so good about life, but also leaves you emotionally invested by how likeable the actors and characters are, as well as the realistic situations they all find themselves in, and the fun and ecstatic music surrounding it all. I’m so glad that I was able to see this movie immediately after seeing something like The Escape, which despite the fact that it did have a lot of strong qualities to it was very much a downer of film; Hearts Beat Loud is, in stark contrast, very much an upper of a film, and a sweet little gem that’ll put you in the right frame of mind no matter how sad and depressed you may be feeling. Hearts Beat Loud is a sweet, likeable and effortlessly upbeat movie that will leave you feeling bright and cheerful about life, which is especially notable given its strong foot in reality which it portrays with strengthened emotion, charming performances, and a funky soundtrack that’s just as happy and cheerful as the vibes this movie gives off.